Buckwheat Zydeco. Courtesy of The Newton Theatre. Newton, NJ – The Newton Theatre is having a Mardi Gras in March with Buckwheat Zydeco on Friday, March 4, 2016 at 8:00 pm. Tickets will go on sale to the general public on Friday, December 4th at 11:00 am. 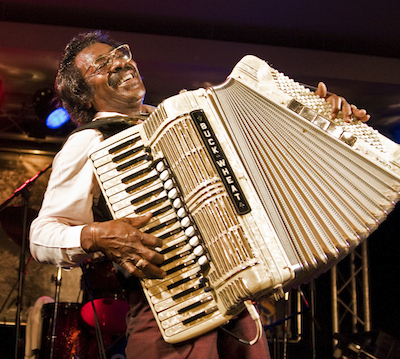 American musical legend Stanley “Buckwheat” Dural Jr., also known as Buckwheat Zydeco, is the preeminent ambassador of Louisiana’s zydeco music. Buckwheat opened the final episode of Late Night with Jimmy Fallon. Buckwheat on accordion, was joined by Fallon on guitar and backed by the Roots, kicking off a rousing rendition of On A Night Like This. That song was the title track of Buckwheat Zydeco’s groundbreaking first Island Records album and was responsible for bringing the unique sound of zydeco into the musical mainstream in 1987. It was also the first major label zydeco record, and a Grammy nominee. No other zydeco artist has come close to selling as many records or exposing the music to more people around the world. The band claims the three largest selling zydeco albums of all time. The band celebrated its 30th anniversary in 2009, and capped it with the release of the Grammy Award-winning Alligator CD, Lay Your Burden Down. In February of 2010 the album won for Best Zydeco or Cajun Music Album. Over the course of Buckwheat Zydeco’s career, Buck has gigged with everyone from Eric Clapton and U2 to The Boston Pops. The band performed at the closing ceremonies of the 1996 Summer Olympics to a worldwide audience of three billion people. Buckwheat performed at both of President Clinton’s Inaugurals. National television appearances include PBS’s tribute to Paul Simon where Buck performed with Lyle Lovett; sitting in with Paul Shaffer on The Late Show With David Letterman; and feting Ozzie Osbourne among other’s on VH-1’s Rock and Roll Hall of Fame Induction Ceremony. Buck was recently profiled in a feature on NPR’s Weekend Edition Saturday. Born in Lafayette, Louisiana in 1947 Buckwheat acquired his nickname because, with his braided hair, he looked like Buckwheat from The Little Rascals. His father was an accomplished, non-professional traditional Creole accordion player, but young Buck preferred listening to and playing R&B. He became expert at the Hammond B3 organ, and by the late 1950s was backing Joe Tex, Clarence “Gatemouth” Brown and many others. In 1971 he formed Buckwheat and The Hitchhikers, a 15-piece funk and soul band. Never a traditional zydeco fan when growing up, Buckwheat nonetheless accepted an invitation in 1976 to join Clifton Chenier’s Red Hot Louisiana Band as organist. He quickly discovered the joy and power of zydeco music, and marveled at the effect the music had on the audience. “Everywhere, people young and old just loved zydeco music,” Buckwheat says. “I had so much fun playing that first night with Clifton. We played for four hours and I wasn’t ready to quit.” Buckwheat’s relationship with the legendary Chenier – to whom Buck always pays homage as the King of Zydeco – led him to take up the accordion in 1978. After a year he felt ready to start his own band under the name Buckwheat Zydeco. In 1994 Buckwheat Zydeco became the first zydeco band to release a children’s record: the beloved, lively, Choo Choo Boogaloo. The recording won an Oppenheim Toy Portfolio Platinum Award, boasts dozens of rave reviews, and remains one of the most acclaimed children’s albums of all time. He later released a follow-up on Music For Little People, Buckwheat Zydeco’s Bayou Boogie, which features children’s music superstars Laurie Berkner and Dan Zanes. After Choo Choo Boogaloo came out, Bucks says he hears all the time from fans young and old that “I wore that album out when I was a kid” or “that’s how I got into zydeco music” or “we couldn’t get in the car without my children asking me to put on Choo Choo.” Nothing makes him happier than hearing that, and bringing the joys of zydeco to fans all over the world. 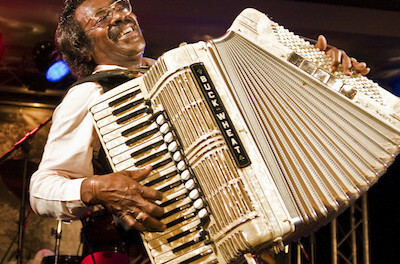 Tickets for Buckwheat Zydeco range from $24.00 to $39.00. Purchase tickets by visiting www.thenewtontheatre.com or contact the Box Office at 973-383-3700.